Now that the chocolate series has ended, I would like to cook and post some savoury foods. Since I went wheat free, quinoa has been a good substitution for wheat. It’s very easy to cook quinoa. This was my Sunday lunch. 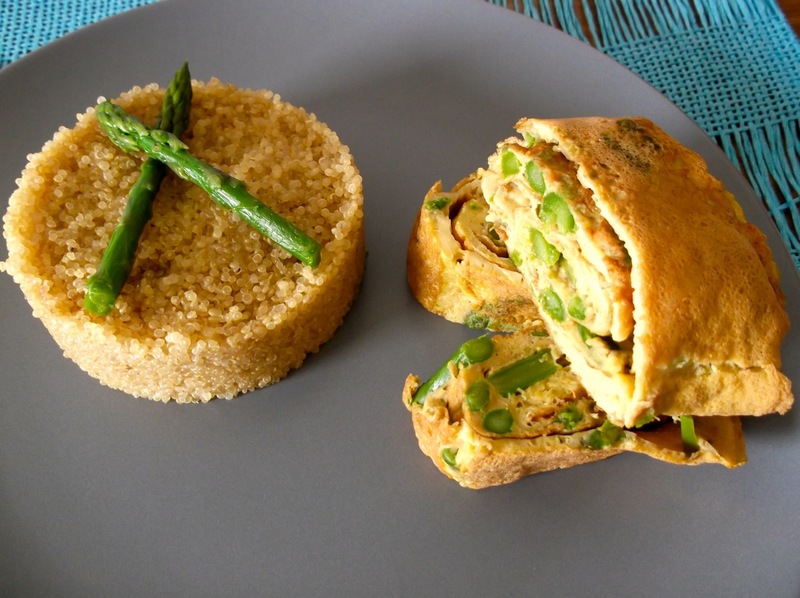 I prepared a omelette with asparagus, as this is the right season for fresh asparagus. Don’t season the quinoa as the thyme in the frittata is enough. Thyme is the best herb so far for omelettes or egg based recipes. Wash very well the asparagus and cut off the tough ends. Boil the asparagus for 10 minutes. In the meantime, beat the eggs with a pinch d salt and thyme. Once the asparagus are tender, cool them under cold water. Cut them into small pieces. Leave 4 floretes for decoration. Heat a saucepan with oil. Mix the pieces of asparagus with the eggs. When the oil is hot enough, pour a scoop of the mixture and spread well. When it is almost done, roll the egg to the top, and pour another scoop starting from the bottom of the rolled egg (so that it forms one piece). Keep rolling and poring until the mixture finishes. Let the rolled omelette cool until it is safe to cut. 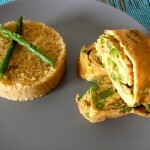 Cut the omelette int 6 pieces and serve quinoa a side. Put 2 florets on top of the quinoa as a decoration.